Dr. Helene Langevin, director of the National Center for Complementary and Integrative Health (a division of NIH), will join massage therapists and researchers at the International Massage Therapy Research Conference (IMTRC) 2019 on May 9-10 in Alexandria, VA. Her research interests have focused on the role of connective tissue in chronic musculoskeletal pain and the mechanisms of acupuncture, manual and movement-based therapies. AMTA recently had the opportunity to talk with Dr. Langevin, and she shared the following insights on massage therapy and pain management. What role can massage therapy play in helping people manage chronic musculoskeletal pain? Musculoskeletal pain is very common and heterogeneous – meaning there are many different forms. Chronic back and shoulder pain can be difficult to manage with conventional tools (medications). The first line of approach for chronic pain should be non-pharmacological manual therapies such as massage, these are important tools that clinicians can use in designing a therapeutic program for patients with chronic pain. When people get into the chronic stage of pain, body-based treatments and behavioral techniques, such as mindfulness or relaxation can be used to help address the emotional response to chronic pain. We need to re-educate these individuals so they can learn to move safely. Where do you see research leading massage therapy into the future? In other words, where is research showing the most promise for massage therapy? We want to reinforce the importance of people with manual therapy skills, who know how to palpate the tissues, and understand the relationship between the muscles and the joints. This skill is extremely important and comes with a lot of training and practice. There is value (in massage therapy) – and we need to better understand how it translates into a clinically effective treatment. We need a lot more research in this area. I like the word biopsychosocial – what I mean is that massage therapy has a measurable biological effect when a mechanical force is applied to the tissue. The massage experience also causes a psychological effect, such as relaxation, and a social effect which changes behavior and how people function. A behavior change can affect the way people interact with their environment, the people around them, and their jobs in a positive way that creates a beneficial feedback loop in the body. 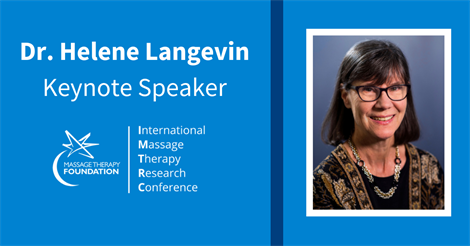 Dr. Langevin will be the Keynote Speaker at IMTRC 2019. Come hear her talk on Health & Wellness: The Role of Integrative Therapies.